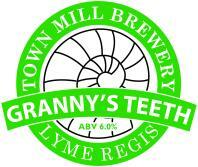 Town Mill’s Granny’s Teeth | DorsetBreweries.com - A Guide to Dorset Breweries and Dorset Beers! Brewed using Maris Otter Pale and Amber malts together with Fuggles and Bramling Cross hops. An amber/brown hoppy Winter Special with a distinctive bitter character.